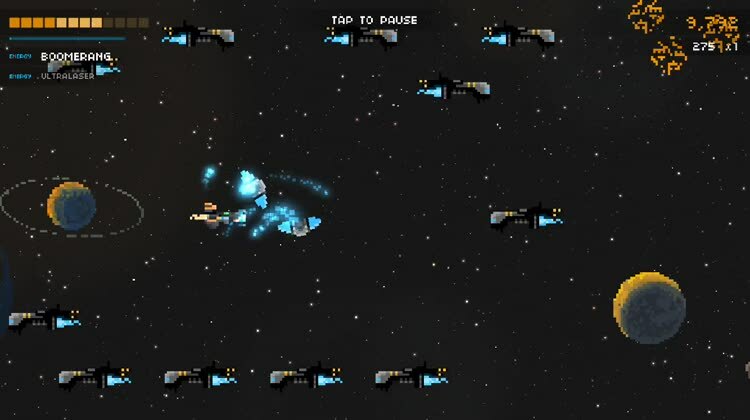 Steredenn ($3.99) by Pixelnest Studio is a bullet hell shoot-em-up game (shmup) that also throws in elements of roguelikes into the mix. 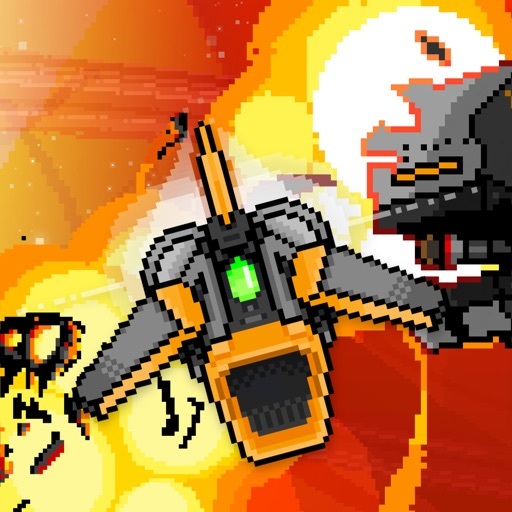 If you enjoyed games like Shooting Stars, Soul Knight, and even classics like Dodonpachi Resurrection, then you will love what Steredenn has to offer. Steredenn is also available on Steam, Xbox One, and PlayStation 4. 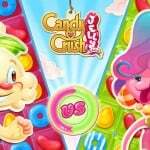 When I’m feeling a bit stressed out, I like to take out my frustrations in the form of video games, and I know I’m not the only one. Usually I’m in the mood for a stimulating puzzle game, but sometimes that just doesn’t cut it. I have the urge to shoot things with lasers and even watch things get blown up in fiery explosions of awesomeness. For these moments, I like to fire up some kind of arcade game, and one that usually involves shooting baddies with an arsenal of different weapons. That’s why I like bullet hell shooters, even though they’re rather difficult, but still challenging and I get my fix of laser beams and various blasts. 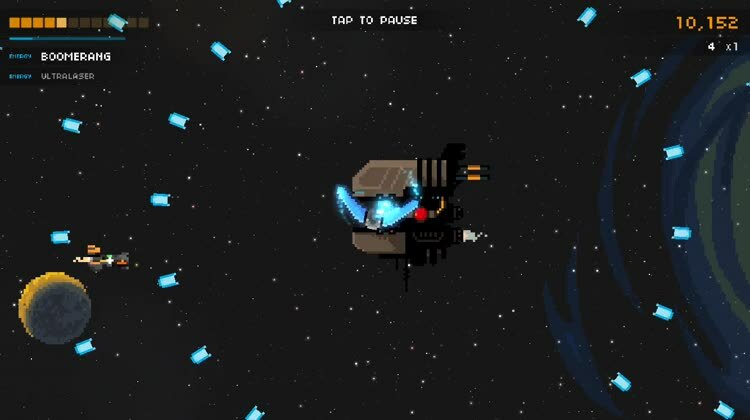 So when I heard Steredenn was going to hit mobile, I was instantly excited to get my hands on the game. Now that it’s here, I can say that it does not disappoint. 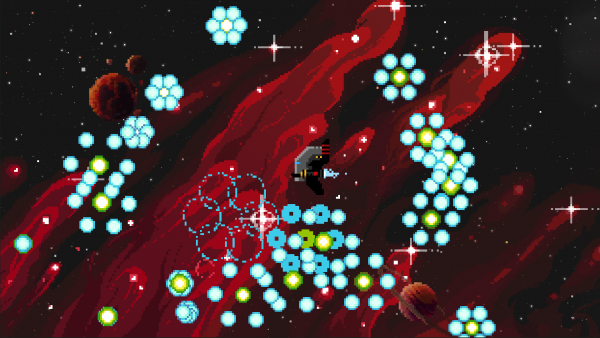 In terms of graphics, Steredenn is a visual feast of gorgeous pixel art. If you grew up in the ‘80s and ‘90s with consoles like the NES, SNES, and SEGA Genesis, then you will feel right at home with the style of Steredenn. While it features a pixelated aesthetic, it’s still incredibly modern and smooth, as everything just blends and meshes together seamlessly. The various spaceships (your crew as well as enemy ships) are packed with plenty of fine details and textures, and the colors range from dark earthy tones to bright and vibrant neon lasers, lights, and explosions. All animations are polished and fluid, with no lag on my iPhone 7. To top things off, Steredenn has a rather awesome blood-pumping metal soundtrack going on, so if you’re a fan of headbanging tunes, then Steredenn has you covered. Overall, Pixelnest did an excellent job with Steredenn in terms of visual and audio design. 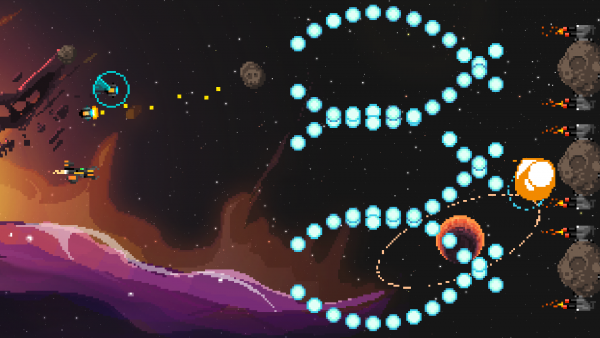 Steredenn has three game modes that are sure to appease everyone: Normal, Daily Run, and Arena. 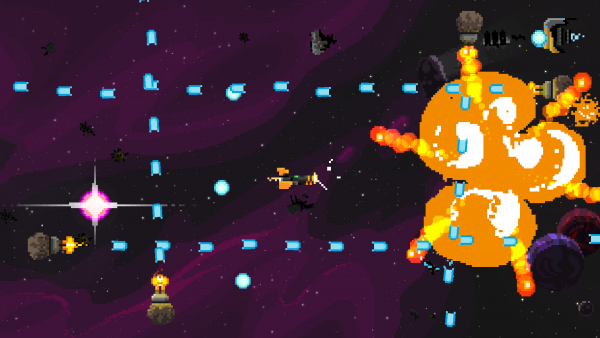 In the normal mode, since the game is roguelike, levels are randomly generated (for the most part) and infinite, so each run features different enemy ships, obstacles, and boss fights. However, the goal is simple enough: fly, shoot, and survive for as long as you can while racking up those precious points for a high score. 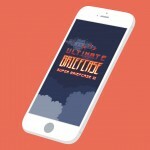 The Daily Run gives players all over the world the same run for the day, with everyone having the same gun and bosses, and you’re competing for the top spot on the leaderboards daily. But be warned — you only get a single chance per day to show off your skill. Arena mode is where you can go face off one-on-one with bosses that you’ve previously defeated in the normal mode. This is great for training and honing your skills. And even though three game modes does not seem like too much, the randomness of the normal mode means infinite possibilities for each attempt, so there is still plenty of replay value. The controls in Steredenn for mobile are pretty simple and intuitive for what it’s worth. To move your ship around, just drag your thumb anywhere on the left half of the screen. To shoot, just long-press on the right half. 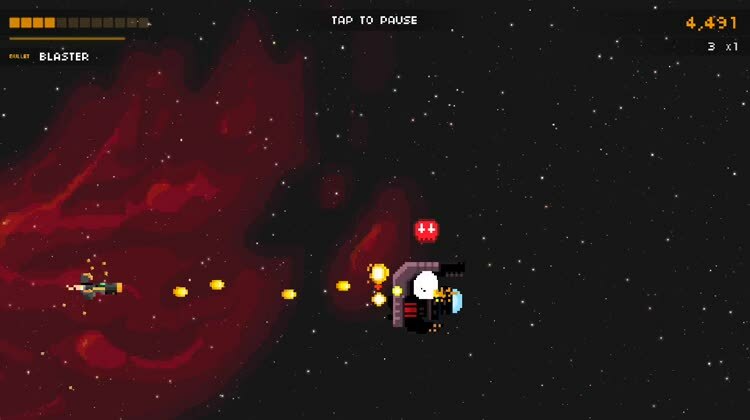 When you have power-ups available on the screen (new guns or weapons or even ship upgrades once you defeat a boss), just hover over the one that you want to pick up, and then double tap anywhere on the screen. When you have two weapons available, you can swap between them at any time by just swiping upwards on the screen. By default, the control sensitivity is on high, but you can change it in the game’s settings to low or normal. Personally, I found the default to work rather well compared to the other ones, so I just stuck with that. If you have a MFi controller, Steredenn has full support for that and the developers say that it is the optimal experience for the game, so make sure to use it if you have one laying around. 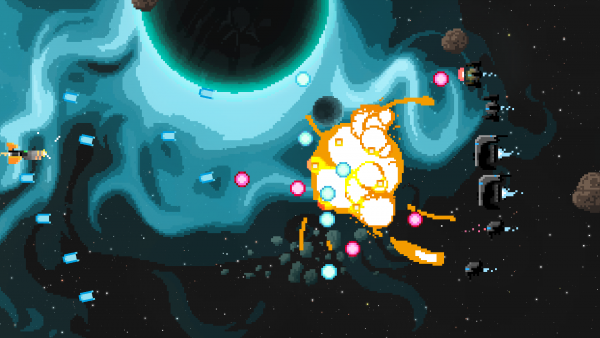 One thing I’ve noticed in my time playing Steredenn is the variety of weapons that you can use to decimate your foes. Unlike other shmups, Steredenn has a large myriad of different ones, including up-close-and-personal melee options. While you can find the standard fare like shotgun, laser beams, and spread shots, I found huge saw blades and even the hard-to-master Jaw. These melee weapons do have a bit of risk involved since enemy bullets will be flying towards you and emanating from enemy ships, but watching foes get chomped on is oh so satisfying. I’ve only started playing Steredenn since last night, but so far I’m in love with the game. It’s fairly difficult, which is to be expected from a bullet hell shooter, but because of the roguelike elements, such as randomly generated runs, it’s refreshing and even more challenging since you can’t predict what comes next. Even though the boss battles wreck me, I still can’t help but keep coming back to it. The Daily Run also gives you something to look forward to each day, and the arena is a nice way to just practice and get better. 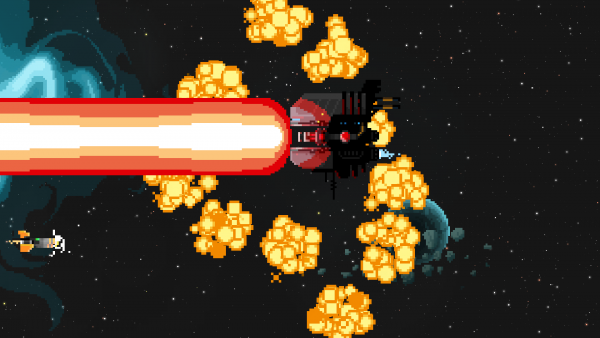 And as a fan of pixel art games, the graphics are top-notch and some of the best I’ve seen lately for a bullet hell space shooter. And who can resist a great metal soundtrack? The only downside to Steredenn is the fact that you can’t play your own music while you’re in the game, even if you turn the music and sounds down completely. Hopefully the developers can change this in a future update, because while the metal soundtrack is great and all, sometimes I just want to listen to my own tunes. 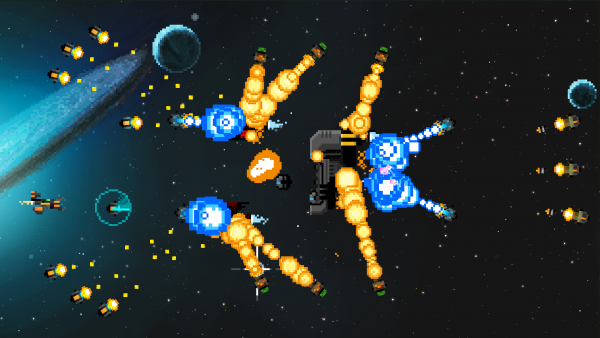 I highly recommend checking out Steredenn if you are looking for an action-packed bullet hell shmup to check out. You can find Steredenn on the App Store as a universal download for your iPhone and iPad for just $3.99. There is also an iMessage sticker pack included. 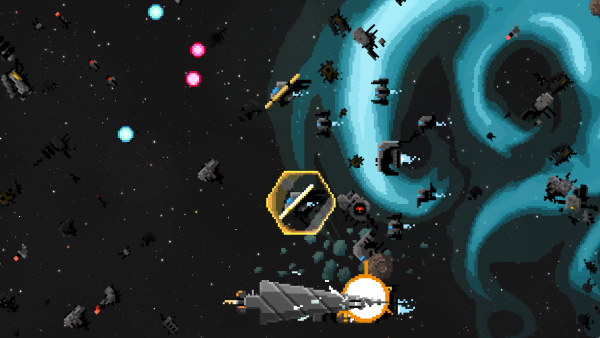 Steredenn is also available on Steam (PC and Mac), Xbox One, and PlayStation 4 for $12.99.